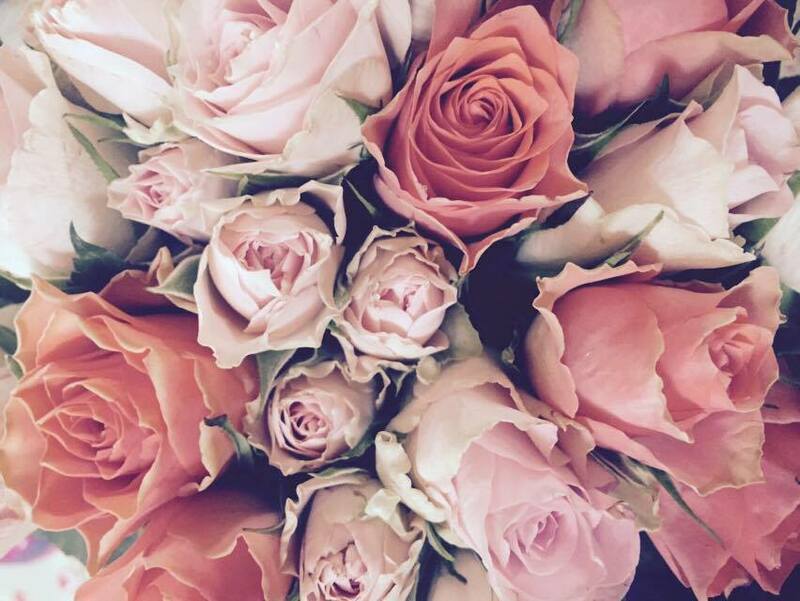 With less than two weeks until the Royal Wedding, have you thought about how you are going to be celebrating that day? On the 19th May 2018 HRH Prince Harry will be marrying the beautiful Ms Meghan Markel at the Chapel in the grounds of Windsor Castle, and I cannot wait! As the country prepares to celebrate along with them, how will you be celebrating the Royal Wedding day? Street parties have been planned it thousands of locations, National Trust properties are showing it wedding on large outdoor screens, garden parties and afternoon teas will also be happening in homes across UK, not forgetting the millions of people sitting in their front room watching the coverage on the TV. Like so many others I cannot wait to see the dress of the year that Meghan will be wearing. For me, our Royal Family is such an important part of British heritage and it should be celebrated. When Prince William got married to Kate Middleton in 2011 I spent the day at home watching every single minute possible on the TV and this will be no different. However I couldn’t miss the chance to host a Garden Party with some friends even if it was a couple of weeks early, when the sun was shining. 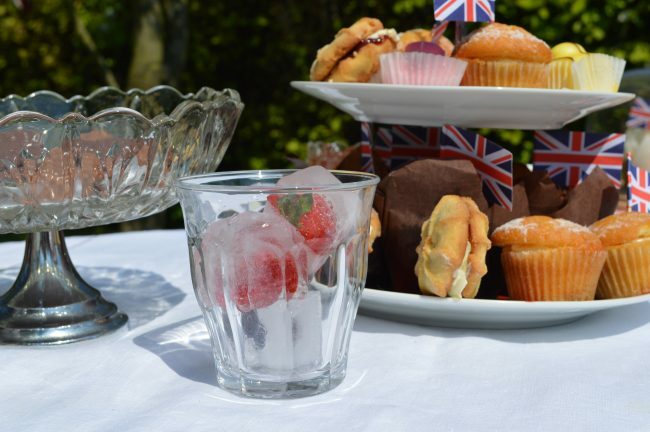 I decided not to host my Royal Wedding Garden Party on the day the wedding, because honestly I didn’t want to be preparing the afternoon tea sandwiches and miss out on watching it all happening on the TV. 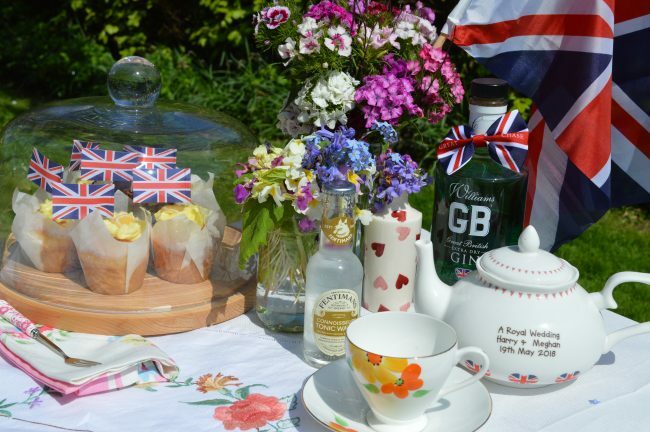 I love an afternoon tea, finger sandwiches, cakes, scones, china tea cups and a glass of fizz to go with it, so what better way to start the wedding celebrations than with a traditional very British afternoon tea. Did you know that afternoon tea was first served back in1840 to the Duchess of Bedford, who started to get hungry about 4pm between her lunch and then her dinner at 8pm. So she requested a try of bread and butter, cakes and a pot of tea be served to her room at that time. As the years followed she invited friends to join her and by the late 1880’s ladies would have afternoon tea parties, but be dressed in beautiful dresses, hats and gloves for the occasion. Since then afternoon tea has been a quintessentially British tradition, with hotels across the country serving them and visitors from around the world wanting an afternoon tea when they come to UK. 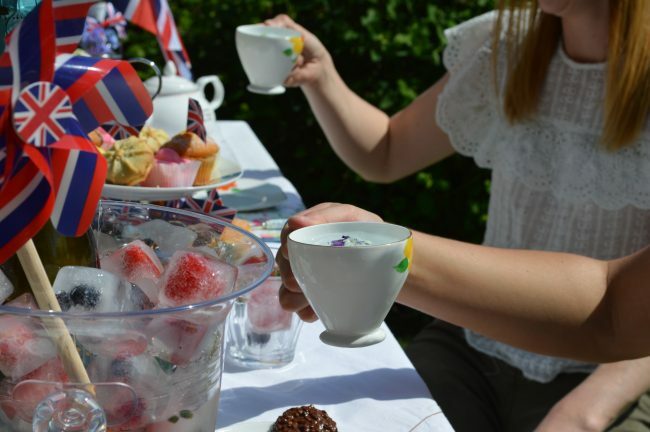 For my Royal Wedding garden tea party, I invited some of my closet girly friends round, my 4 year old daughter and baby niece to share the fun. An afternoon tea is made up of various finger sandwiches, mine included, salmon and cream cheese, ham and the cucumber, with a mix of white farm house bread and a seeded batch loaf. All delicious. My scones were served with clotted cream and my home made plum jam from the fruit trees in our garden. Then a variety of cupcakes, french fancies (my sisters favourite), Viennese whirls with lots of little flags, that I added in extra. I have a lovely collection of cake stands, that I have been collecting for years. The cake dome is a new addition from ProCook, I love it, it’s perfect for cupcakes, a larger cake and even for cheese. I even borrowed my Hubby’s Gran’s vintage glass cake stands. 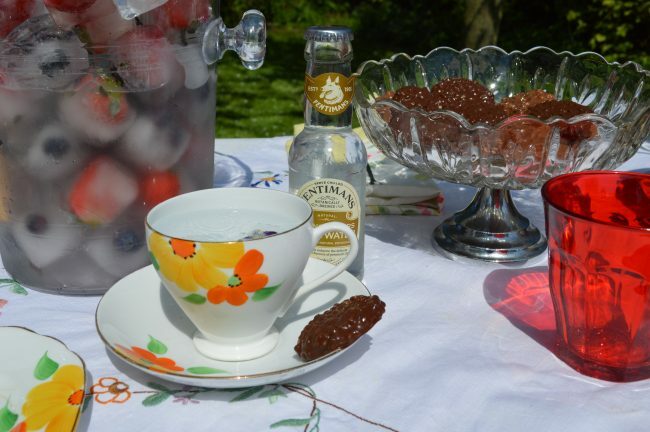 As the day was the hottest of the year so far, I decided that pots of hot tea was not what we needed, so instead I used my Royal Wedding tea pot filled with ice cubes and my new favourite William Chase Gin. I borrowed my Hubby’s Gran’s pretty little china tea cups, added ice and then topped them up with Fentimans, Connoisseurs tonic water, that works perfectly well with the William Chase Gin. As you all know I am a big lover of gin, so trying out a new gin and another of Fentimans fabulous tonics was great for me, my friends are all gin lovers too, I guess you have to be to fit in at our house. It’s not often people come round and the gin isn’t out. No cup of tea, even if it is gin, is complete without a biscuit on the saucer. These luxury biscuits by Elizabeth Shaw are amazing, I was sent the raisin and hazelnut plus the mint and cocoa. Although both very tasty I loved the raisin and hazelnut ones the most, however all of the biscuits got eaten very quickly. Yum!! As my little girl was joining us, she was drinking water with fruit filled ice cubes. However, I was slightly concerned about her having Gran’s vintage china tea cups. So, she was using some glasses that have been toughen and are also designed that if they so smash they will shatter into cubic pieces to reduce the risk of injury. Perfect for my little girl to think she is more grown up drinking from glass cup, instead of her normal plastic ones. 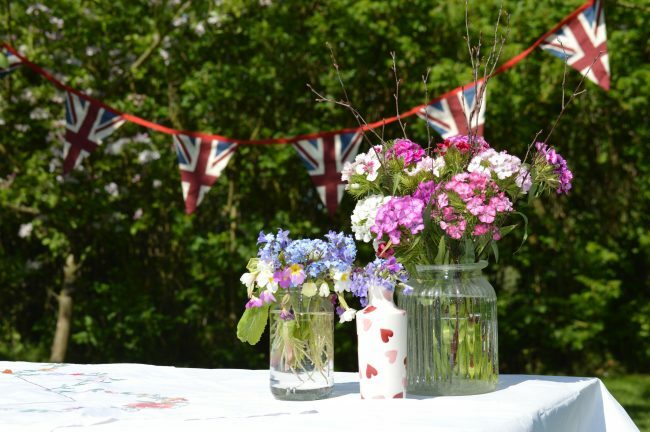 No Royal Wedding Garden Tea Party would be complete without the addition of Union Flag bunting hanging from the trees. I managed to find mine on amazon for about £6.99 they have a real vintage feel to them, plus they are fabric which I plan to use in my son’s bedroom, when we eventually get round to decorating. 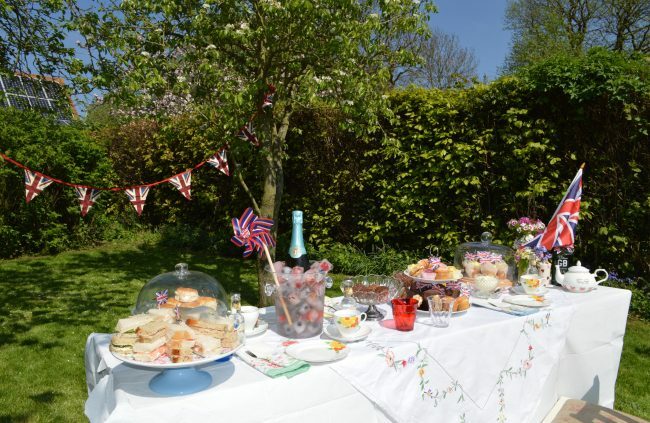 Every celebration includes a bottle of fizz and for my Royal Wedding garden tea party I used Prosecco, which is a favourite among my girly friends. I added fruit to the ice cube trays when I froze them, to add a bit of colour to the ice bucket. 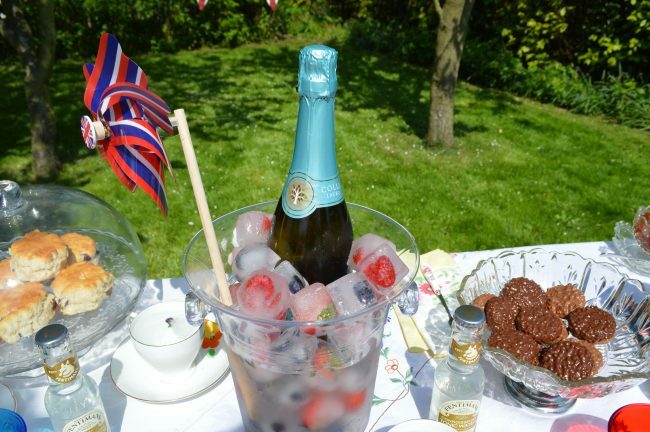 Placing the Prosecco into the ice bucket helped it to stay cold on such a hot day. Plus we used the ice to add to the gin and tonic throughout the afternoon, the fruit in the ice also flavoured the gin as the afternoon went on. Well that’s my Royal Wedding garden party! How will you be celebrating? Have you ever been to a casino? Well up until last week, I hadn’t. I always thought about them as either very posh, tuxedos and cocktail dresses (very Oceans 11) or as dark, grotty, seedy places that women generally don’t go. How very wrong I was! 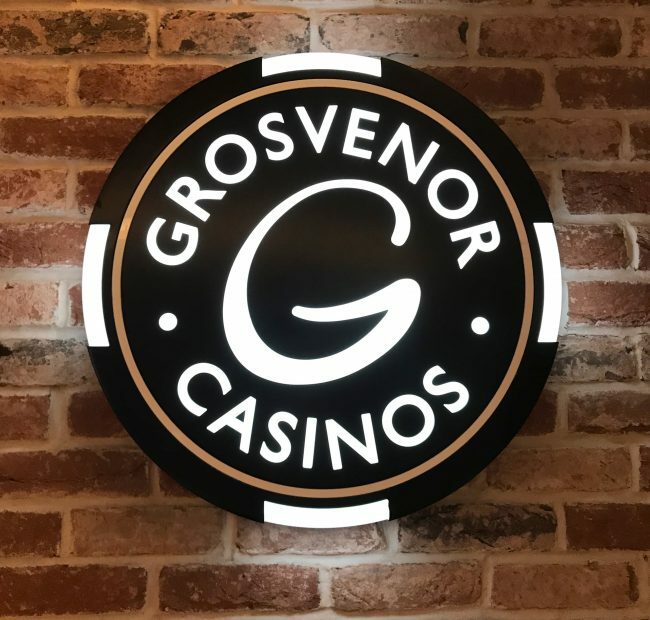 The Grosvenor Casino in Nottingham, invited me and 3 friends to spend an evening with them, to see what a modern casino is really like and to try out their new menu. I invited 3 of my closet friends, who had not been to a casino before either. We arrived to be greeted by the manager Daren Brain, who gave us a tour and explained that he worked on the refurbishment of the old casino. 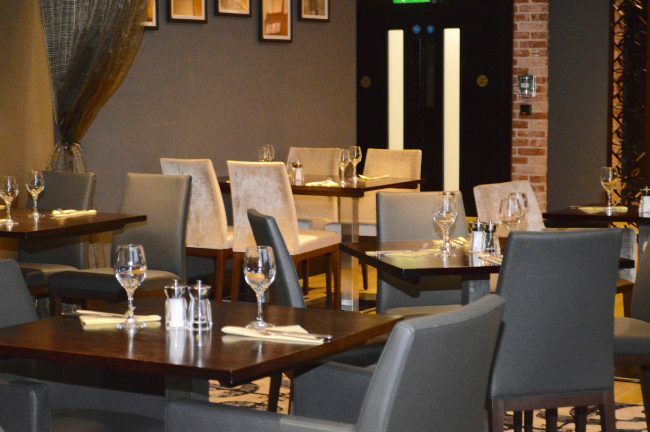 The refurbishment saw big changes within the casino, a restaurant, a bar area with large screens for sporting events, the addition of sectioning off areas for VIP’s or private events. 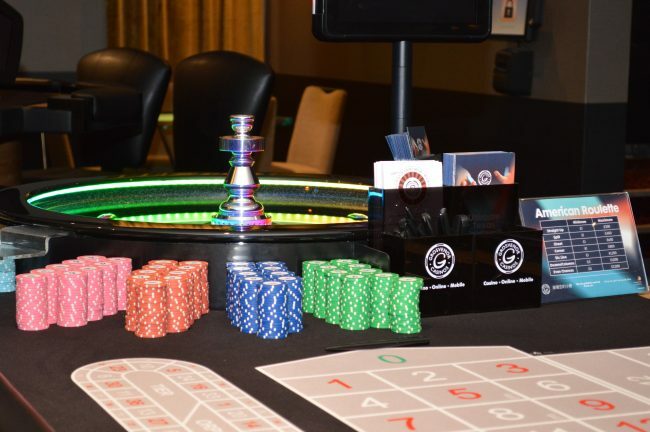 An open space for American Roulette, blackjack, punto banko, Texas Hold’em cash game tables and the online roulette gaming machines. There was also a balcony with a couple of outside slot machines, so the smokers can play while outside. Not forgetting the double license for additional slot machines, spilt over two areas, in the more lively area by the tables and a quieter area at the other side of the reception. I was surprised by how inviting the whole place was, lots of space, chairs and tables for sitting to enjoy a meal or watching something on the big screen. The reception area was large, with a very inviting bar in eye sight. The casino area was large, plenty of space to stand around the tables, with a VIP area that is closed off when they have high rollers in or hired out for events. To mark it’s 1st anniversary of opening, Daren and the team have launched a new meal and cocktail menu, which we came to try out. We ordered cocktails and were shown to our table for dinner, the restaurant area had a luxurious modern feel it to. As you know I love a nice cocktail so seeing a menu full of different ones I would like to try is always good. 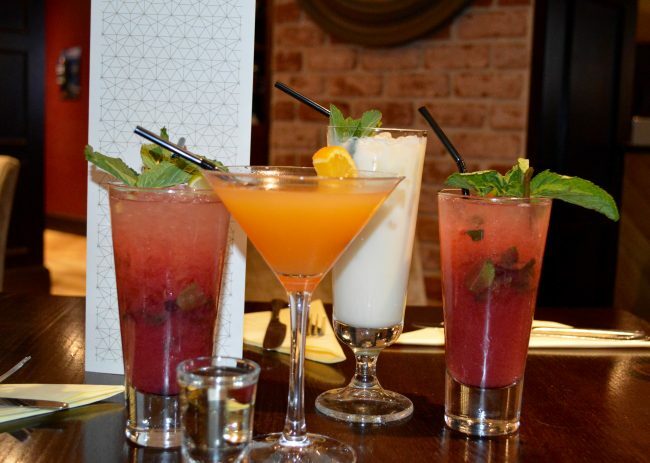 They arrived and we all enjoyed them, I choose a ‘Passion Fruit Martini’ and two girls went for the ‘Raspberry Lynchburg Lemonade’ and driver went for the ‘Virgin Colada’ all great cocktails. I generally stick to Champagne or Prosecco based cocktails and I haven’t found one I don’t like yet. Looking back I’m not sure why we only had one cocktail each, we should have ordered more, they all looked delicious. While enjoying the cocktails we looked at the menu. The restaurant manager recommended the calamari and the buttermilk chicken for starters then the fillet steaks for main course. Plus a bottle of rosé to enjoy with it. We decided that we would choose 4 different starters so we could all try a bit of everything. We ordered nachos, salt and pepper dusted fried calamari, fried cajun buttermilk chicken strips and tender slow cooked pork ribs. Which all arrived in a good time and tasted amazing the calamari was the best I had eaten, I would definitely order those again and not share them. As a group we were all happy with the starters and really enjoyed eating them. For our main courses, we all found it quite difficult to choose something because there was lots of choice and all sounded very appealing. In the end I went for the 7oz fillet steak, cooked well done, with a Caesar dressing over the lettuce side and the red wine sauce for the steak. One of the others also opted for a fillet steak cooked medium rare, with a blue cheese dressing over the lettuce side and the bourbon sauce. The other two girls chose the classic double beef burger, they both added cheese. The four of us also went for sides of fresh vegetables and onion rings. The steaks were both cooked perfectly to our individual likings. I have so many times had to return a steak when it has not been cooked through enough for me. This was perfect! The sauce that came with both of the steaks were also delicious, we all tried both of them. I loved them both and would struggle to choose between then if I was to order another steak. The girls burgers were fabulous, really big, loads of extras inside the bun along with chips and whatever sauces your fancied. They were burgers that my Hubby would be really impressed by and he likes a BIG burger. After our main courses we ordered puddings, the restaurants staff recommended the waffles, but we all went for something else. Two of us ordered the peach and raspberry cheesecake, I love a cheesecake. The others went for the three berry mousse cake and the salted caramel chocolate roulade. 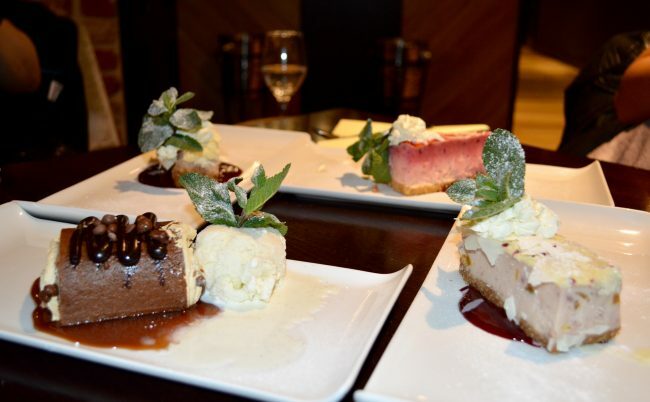 The deserts were all delicious, we sampled each others not wanting to miss out. I was not disappointed with cheesecake, it was lovely. Although when Darren came over and spoke about the waffles I kind of wish I had ordered them instead. 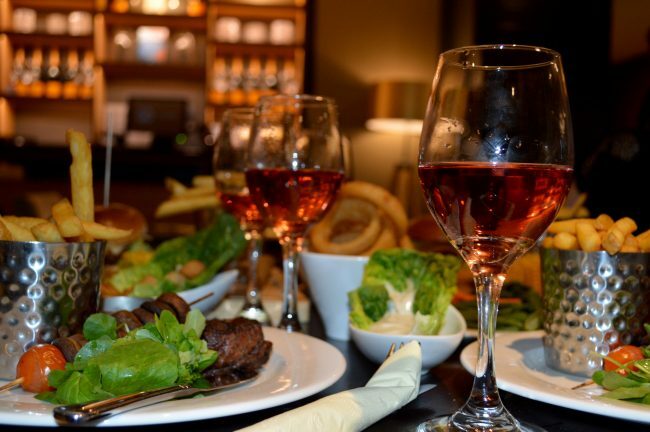 Ask any of my friends, I am definitely one for sending food back if I don’t feel it is up to standard, I am also well known for making complaints if the service isn’t up to standard or the staff have poor attitudes. So for me to go out for a meal and genuinely be 100% happy with everything is quite unusual, and I found this at the Grosvenor and believe me, even I was surprised. After our meals we headed for a lesson on the American Roulette boards, the casino is the only one in the country that offers the colour changing roulette wheel. I did not have a clue. I know literally nothing roulette. However after an enjoyable 30 minute lesson we all came away thinking we knew a little bit more about it all. I seemed to do really well with the winnings while having our practice lessons, I just seem to wing it enough to win lots of chips, unfortunately they did not transfer into piles of money. We moved over to a quite blackjack lesson, which was easier to understand however I was rubbish at it. A couple of the girls seemed to really have the knack of it. Once we had finished our practice lessons, on to the boards we went…… well, honestly we went to the online roulette boards. They just seemed less intimidating than live tables with lots of people around then that all seemed to know what they were doing. It was so much fun just having a go on a few numbers, or black and red. We played for about an hour or so between us and I came away 45p up. Which for someone who had never even stepped foot in a casino before or really even played a game of cards other than snap or rummy I think I did ok.
After our evening of amazing food and drinks, plus all the excitement of winning 45p we heading home. Each one of us throughly enjoyed our evening with Daren and team, they made us feel welcome and even though non of us had a clue about casino games they were more than happy to give us lessons. We all came away saying that we would go again, for food, drinks and also roulette, we might even take our partners along. Although I hadn’t really thought about it before as a hen party location. I really think it would be a great laugh. 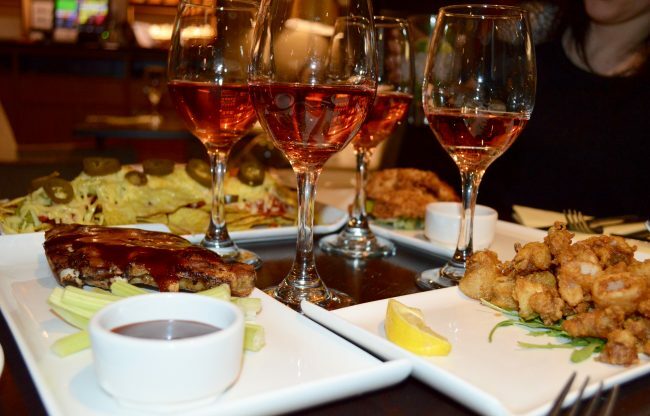 Head there for a fabulous meal, cocktails, enjoy the atmosphere of the casino before heading into the city with a group of girls. Daren said it is quite popular with hen parties but as you would guess very popular with stag parties. Thank you to Daren and the team at The Grosvenor Casino in Nottingham for having us all along for the evening. I look forward to coming back again one day soon. We love chips in our house, I mean who doesn’t? However I am aways looking for ways to add more fruit and vegetables into our meals. Not only that but ways to cook things in a healthier way. 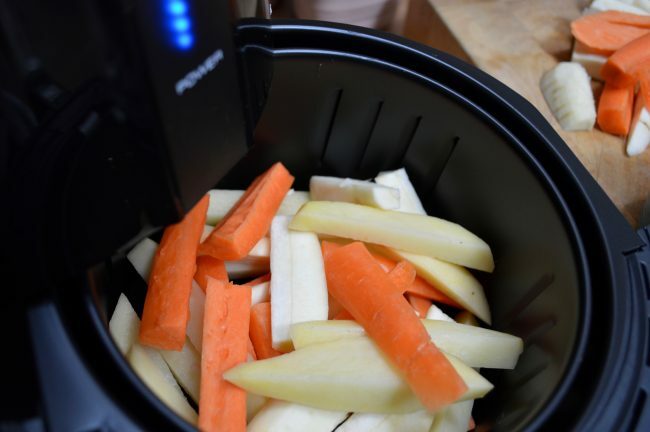 I have read about using air fryers on a couple of occasions over the last few years. I have friends that have different ones, but it’s just a kitchen item we just dint have until now. 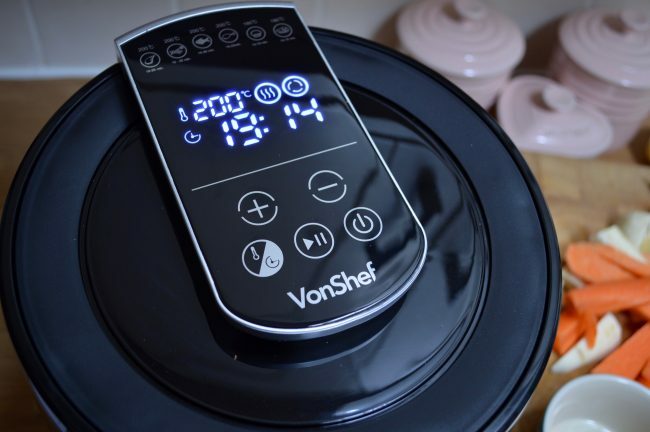 Domu got in touch and asked if I would like try out their VonShef digital air fryer, of course I have been wanting to try one out for a long time. But what to make with it? As I said we love chips, but they can be quite greasy and generally not the healthiest food item. So instantly I thought that chips would be great to try it out. But not just any chips…… chips four ways. 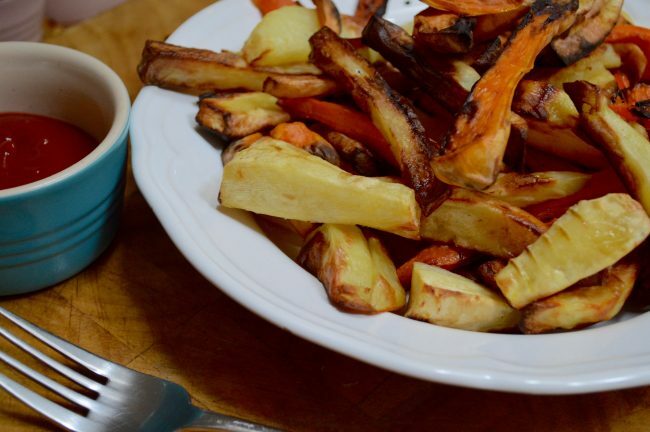 Chips made with potatoes, sweet potatoes, carrots and parsnips. Yummy! 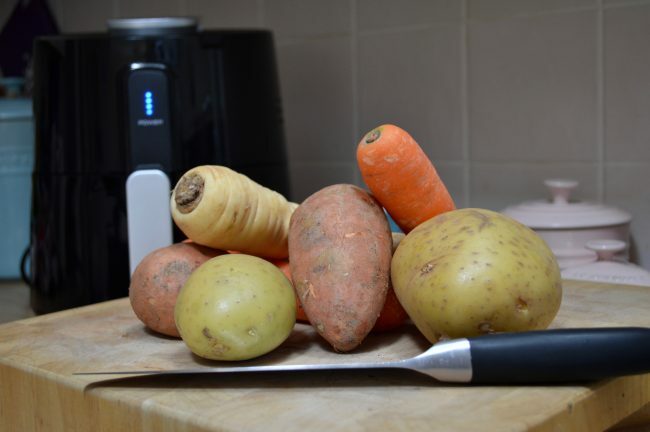 When the digital air fryer arrived, I was keen to unpack it and see what I could do with it. I was surprised with how large it is, I’m not sure what I was expecting but not something quite so big. It however isn’t so big it wouldn’t fit into a cupboard after it had been used, thank goodness because I like my cooking equipment to bit kept away, even the toaster gets packed away after use. I read the instructions, very easy to use, simple digital display, before the first use you needed to set it to 200° for 10 minutes to burn off any manufacturing residue. At the end of the 10 minutes it beeped to let me know it had finished. While it was going I set about, chopping and peeling the vegetables. Just as you normally would when cutting potatoes into chips cut the sweet potatoes, carrots and parsnips in the same way. The instruction booklet tells you had long you need to cook the potatoes for, for home cut potatoes it recommends 20-22 minutes set at 200°. Adding the four vegetable chips to the basket with one table spoon of vegetable oil to the basket, set the temperature and time and press start. I did check them half way through and gave them a mix up. After 20 minutes we had perfectly well cooked chips. I did make a couple of baskets of chips for us all to share, we all loved them. Happily dipping them into the tomato ketchup as we went along. 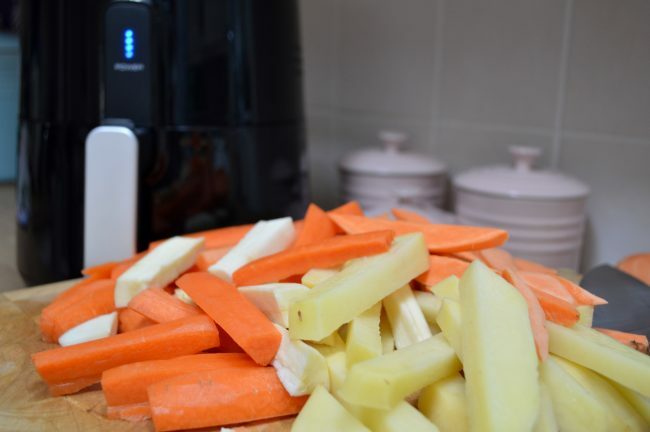 I was really impressed with how easy the digital air fryer was to use and with how it cooked the chips so well, your able to cook so many different items within the basket, many things not needing any extra oil, making them really healthy, perfect if you want wanting to have little treats without worrying about the extra calories. I cannot wait to try making something else in the air fryer.